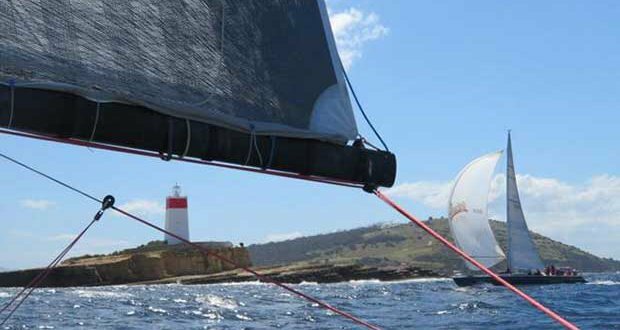 Octogenarian yachtsman Don Calvert obviously has lost none of his tactical sailing skills on the River Derwent and Storm Bay with his 33-year-old Castro 40 Intrigue. Calvert steered Intrigue to a double handicap victory in Group 1 of Saturday’s Combined Clubs long day pennant race, winning both IRC and AMS scoring categories of the 29-nautical mile race to Betsey Island and return. 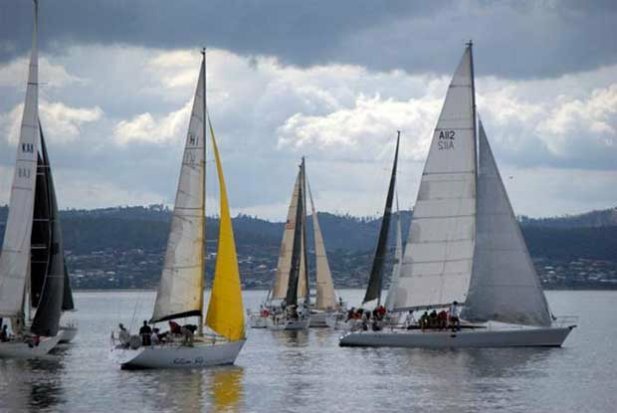 Calvert’s sailing career on the River Derwent and southern waters with the Royal Yacht Club of Tasmania extends back more than 60 years, the past 33 seasons sailing Intrigue with continued success. Calvert showed initiative at the start, in just two knots of breeze, electing to start to leeward of the fleet in clear air. After two-sail reach down the river,Intrigue was thus among the first boats to pick up the freshening sea-breeze between Blackman’s Bay and the Iron Pot, then enjoying a fast spinnaker run back from Betsey Island in a 15-20 knots sea-breeze. Under IRC scoring Intrigue won from Doctor Who (Rod Jackman) and Gavin Adamson’s Madness. On AMS, Intrigue placed first on corrected time From Zephyr (Ian Johnston) and Wild West (Michael and Michelle Denney). Wayne Banks-Smith’s Farr 40 War Games led the 46-boat fleet home, clear ahead of The Fork in the Road (Gary Smith), Doctor Who and Wild West. Group 1 PHS first place went to Filepro (Tim Gadsby) from Doctor Who and Madness. Closest finish of the day was in Group 4 at the end of the 26-nautical mile race to Little Betsey Island and return, with Hornet (Neville Georgeson) beat Ingenue (Nigel Johnston) across the finish line by one second. On PHS corrected times Ingenue finished second to Camlet Way (Stephen Mannering) while Hornet placed eighth. In Division 2, the syndicate-owned Twitch had an outright PHS win from 42 South (Mark Ballard) and Jiyuu (Peter Davis). On AMS scoring Jiyuu won on corrected time from Wings Three (Peter Haros0 and 42 South. Kamehameha (Frank Chatterton) followed up its first pennant race win in Group 3 two weeks ago by winning today’s race on PHS scoring from Wild Fire (Malcolm Robertson) and Saga (Chris Sheehan). The two Young 88s, Young Lion (Steve Chau) and Saga filled the first two placed on AMS handicaps, third place going to Mako (Phil Soley).